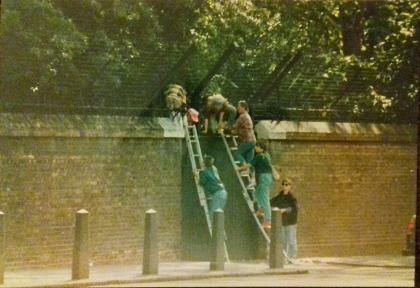 Buckingham Palace Action, 6th July 1993. This section contains quite a lot of the materials that I still hold and can publish without infringing copyright. 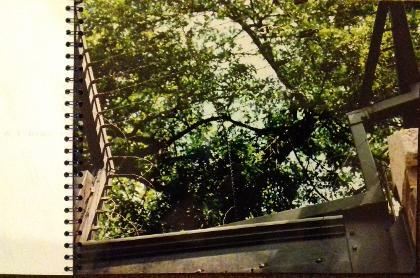 Above Left, Cover of Police Photo Album. 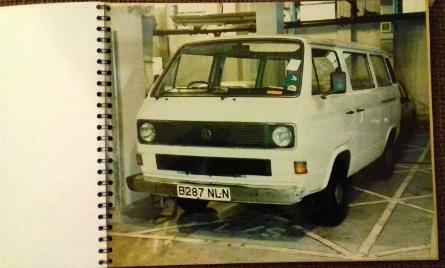 Above Right, Di McDonald's van captured at Charing Cross Police Station. 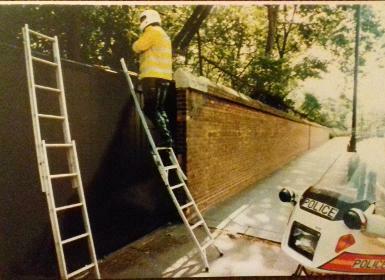 Above Left, Police Photograph of hole in HM's fence. Above Right, Police Motorcyclist arrives a bit too late. 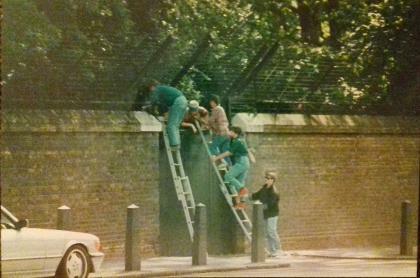 Above Left, women making their way over the wall, 1. 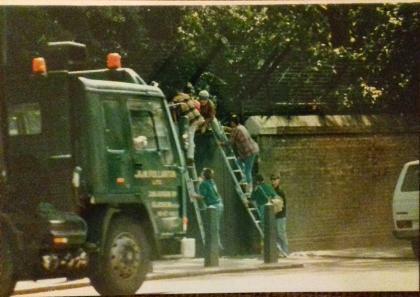 Above Left, women making their way over the wall, 3. 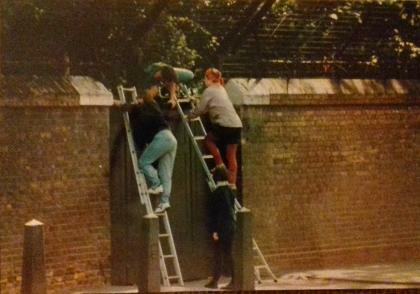 Above Right, women making their way over the wall, 2. 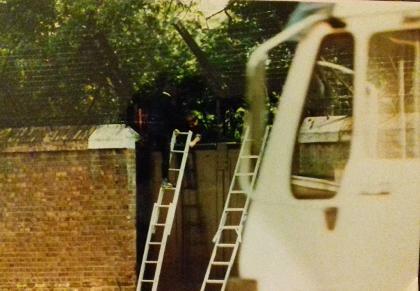 Above Right, women making their way over the wall, 4. Above Left and Right, the last of fourteen women climbs over the wallinto the grounds. She is mentioned in the statement of John Hurst ("Interviews with two passing journalists", link is below). 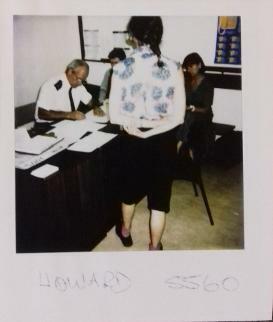 In the Cells, 6th July 1993. 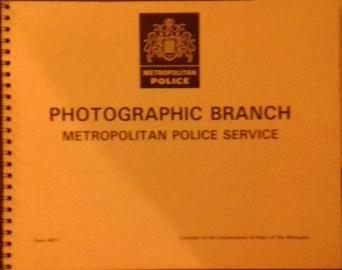 We were arrested and rounded up and taken to Charing Cross Police Station. To the Right is the only photograph of me taken that day. 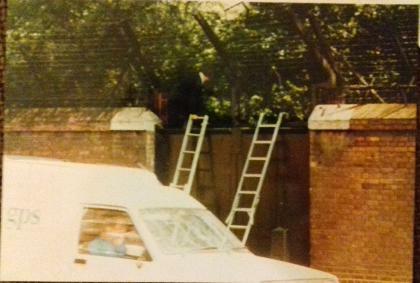 I was one of the first women over the fence and the official photographer certainly didn't take my photo! 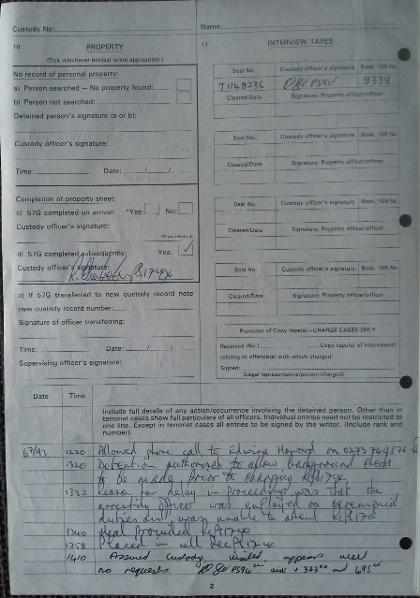 Included below are the police interviews with two passing journalists whom the first officer on the scene arrested even though they had chased him down the street to point out the breach in security. 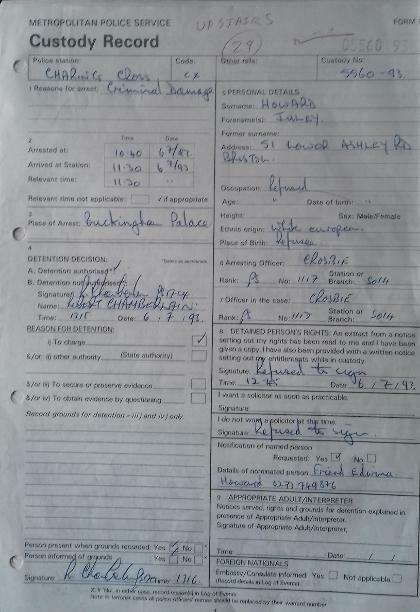 Following this the eye witness and Buckingham Palace Police statements are typed. These statements show how the police conducted their investigation. It is a bit boring in places, in others it seems like they are clutching at straws, sometimes it reads like a comic sketch. They start the interviews as if they do not really know what questions to ask and make an awful lot of assumptions. 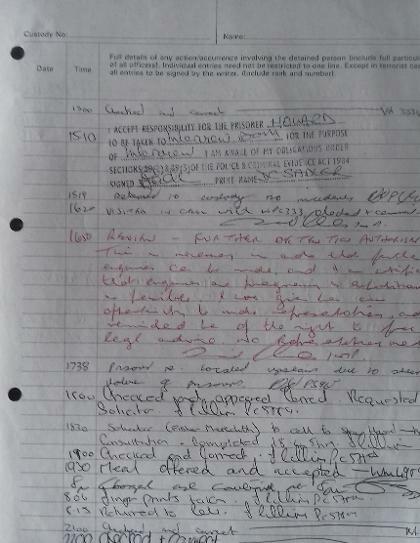 The third PDF is the interviews with the fifteen women detained or arrested during the action. Two other women were arrested, de-arrested and immediately chucked out of the front gates of Buckingham Palace. It seemed that their arresting officers declined to make a statement so there was no evidence to support their continued detention. 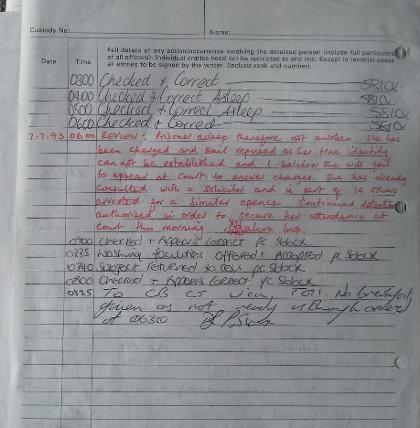 Below are the main pages from my custody record.